Islamic State terrorists continue to gain ground in the Syrian city of Kobani, but the White House downplayed the significance of this development for President Obama’s anti-terrorism strategy in Syria. “I would not agree with that assessment,” said White House Press Secretary Josh Earnest when asked if the loss of Kobani would be the first sign that Obama’s strategy to degrade and defeat ISIS had failed. Earlier, Pentagon spokesman Rear Adm. John Kirby told reporters that the United States should be “steeling ourselves” for the “eventuality” of Kobani falling to ISIS. 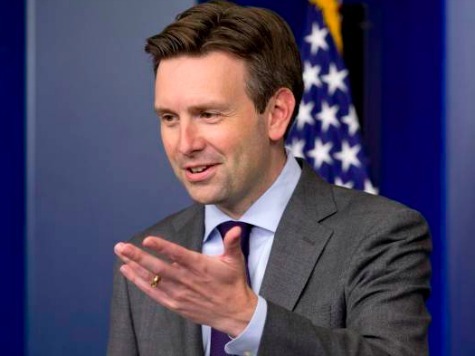 Part of the reason the US was unable to push back the ISIS gains in the city, Earnest admitted, was that Syrian rebels were not yet trained to fight them on the ground. Earnest insisted that the US had made gains in the fight against ISIS but that their options were limited.